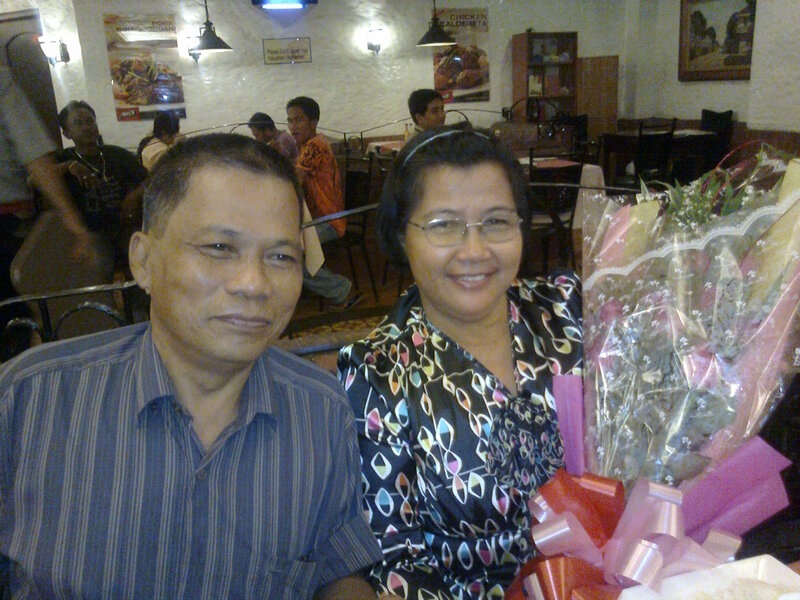 Mom and Dad celebrated their 28th wedding anniversary through a dinner at Max’s Restaurant. It was a close family affair. Just the five of us – Mom, Dad, Myslef, Deng and Janelle. We usually celebrate their anniversary at home and invite family and friends to come over to enjoy family favorites prepared by my mom. These favorites include but not limited to: roasted herb chicken, inihaw na bangus, kare-kare, lechon kawali, sinigang na hipon, beef steak, sisig, lumpiang shanghai, Mom’s pancit canton and our all-time favorite buko pandan. This year, we decided to give Mom a rest from all the cooking. So we opted for Max’s to serve our favorite dishes. As I had to come from work, we decided to meet up at 7:00 pm. Deng arrived an hour and a half earlier to set up our little surprise. Max’s is a family favorite. It’s the second restaurant I memorized right after Jollibee. We loved the way they fry the chicken and I personally love the caramel bar. It’s best to eat with coffee or peppermint tea. 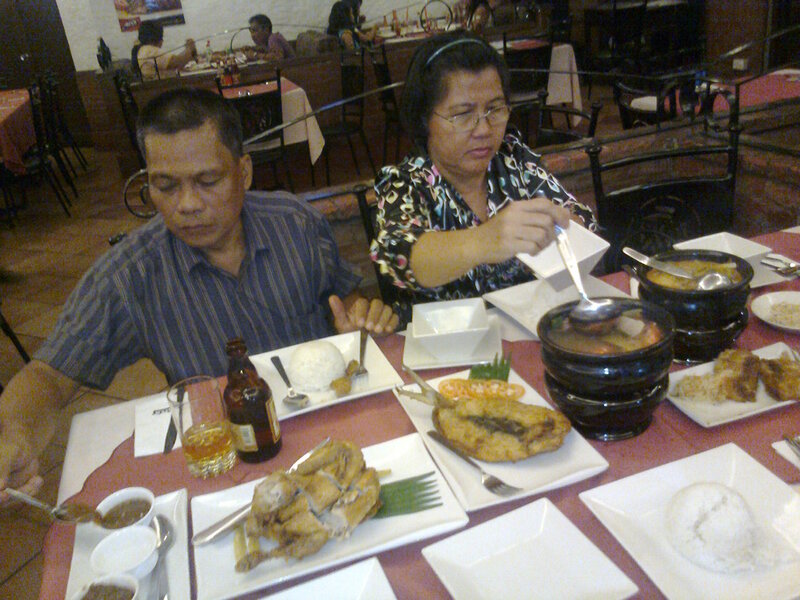 The family dinner started with a prayer to thank God for my parents’ good health and their strong relationship. My dad used to work abroad, thus, Deng and I practically grew up without him around. It was different with Janelle’s because she was born when my dad retired from work. I could see how my dad treated my youngest sister and in a way, I knew it would have been like that for Deng and me. 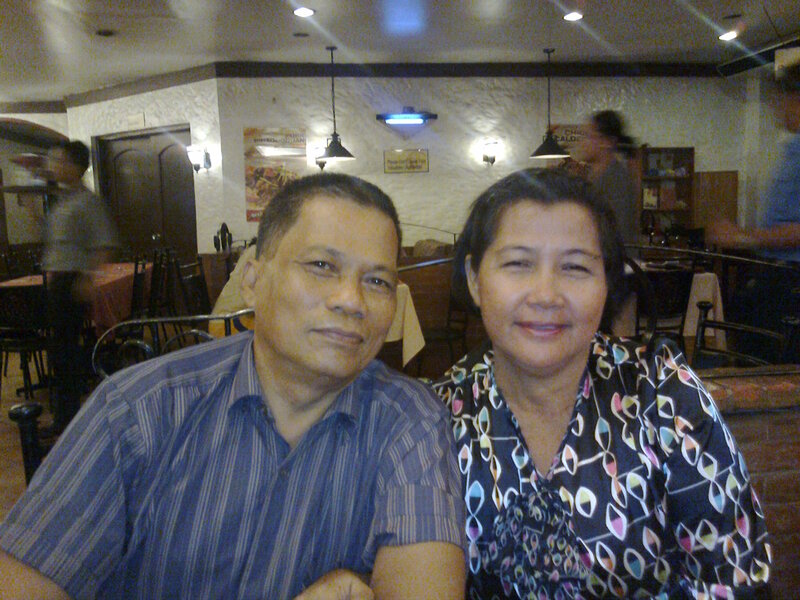 Since my dad’s retirement, I saw my parents’ relationship grew every year. It’s funny how they would have little disagreements and I would find myself torn in between. Being the eldest daughter in the family, I get to hear each side’s argument. I know that they know what they are doing but it feels good to be trusted by them. The food was served after half an hour and we enjoyed our favorite fried chicken, boneless bangus, sinigang na hipon and kare-kare. Just before dessert was served, the service crew brought in our surprise – a bouquet of flowers! I think I saw tears in my mom’s eyes but she held them firmly. She smiled and I knew she enjoyed the gesture. Plus the fact that other diners were probably looking at us and admiring her bouquet. She surely enjoyed the moment. 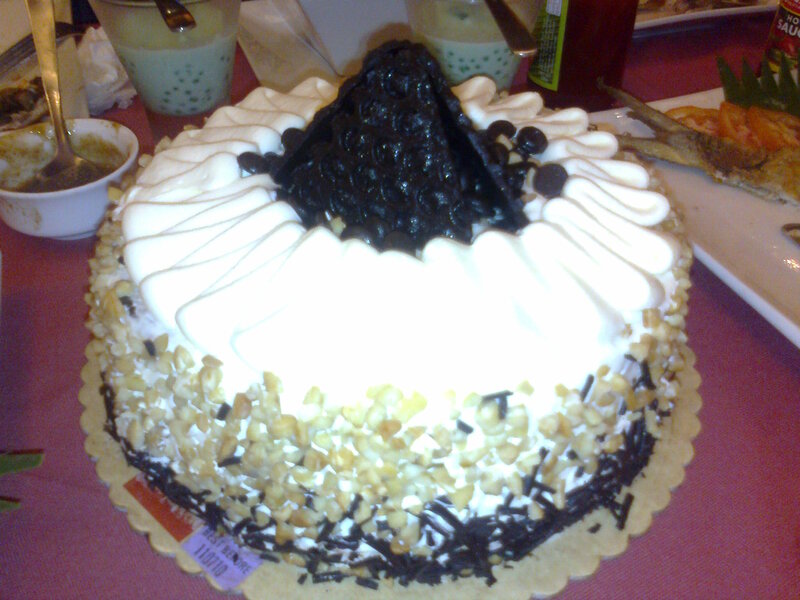 We shared the cake and each had buko pandan. Although Mom’s version is still unbeatable! Happy Anniversary, Mom and Dad! Stay Dolce! A new specialty store opens in Salcedo Village, Makati last March 2010. For chocolate lovers like me, Chocolate Fire is a must-visit place. I’ve heard good reviews about and I must taste it to believe. I am looking forward to their strawberry dipped in dark chocolate, belgian hot choco and cappuccino. Oh, they also have gelato! I have to try it soon! Here is a link to their website. 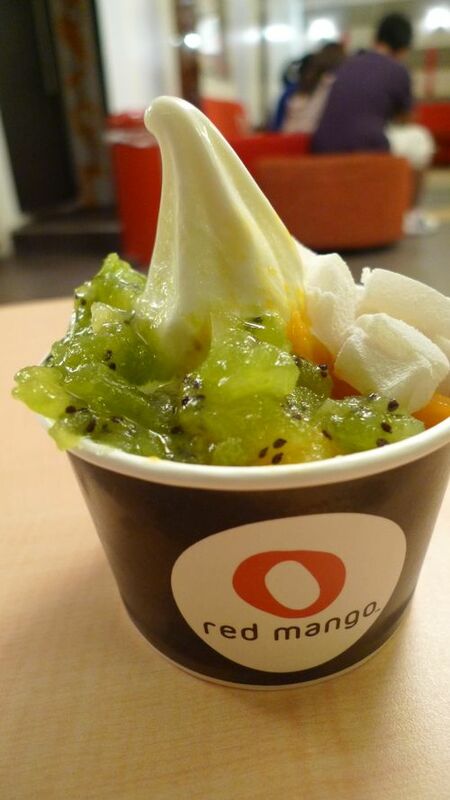 Being lactose intolerant, the idea of frozen yogurt is so appealing to me. So the first time my friend Anya brought me to Red Mango (Eastwood Mall), it was love at first sight. 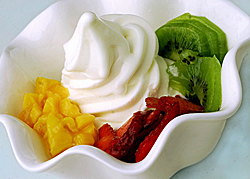 I ordered medium-sized, original frozen yogurt with three toppings (blueberry, kiwi and almonds). Refreshing. Light. Guiltless. Oh, aside from the frozen yogurt, you have to try the waffles! Simply delicious! I also like the atmosphere of their stores. It’s fun, young and alive. I think it is because of the red motif. Sadly, you get to enjoy dining pleasures once in a while because their branches are usually packed with regulars, especially during weekends. I guess they have an average of 50 customers per hour including take outs. Life is indeed sweet. To celebrate this truth, I will be dedicating all of my entries from January to February 2010 in chronicling my favorite desserts’ restaurants/kiosks/stations/stores in the metro. And if I get fortunate, I can find sweet destinations outside of Manila. This is still part of my food adventures with Zha.  So watch for my entries! I must admit that the Kapampangans are great cooks. My dad is Kapampangan and yes, he cooks well. I also think that 50% of my love for food and cooking came from him. The other half is from my mom who is Bikolana. That topic will be discussed in another blog entry. For now, I will talk about one of my favorite native Kapampangan dishes, the buro. “Buro” is the Tagalog word for “preserve” or “pickled. 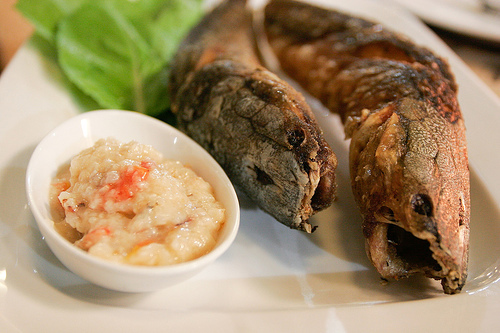 Burong Kapampangan is a form of fermented rice with fish or small shrimps. This is a great side dish for fried fish (especially Dalag and Dalagang Bukid), steamed vegetables (Mustasa, Sigarilyas) and Sinigang na Isda sa Miso. However, this native delicacy is not for the fainthearted or should I say “faintstomached”. lol The look, the taste and above all, the smell of this dish can make or break one’s appetite. 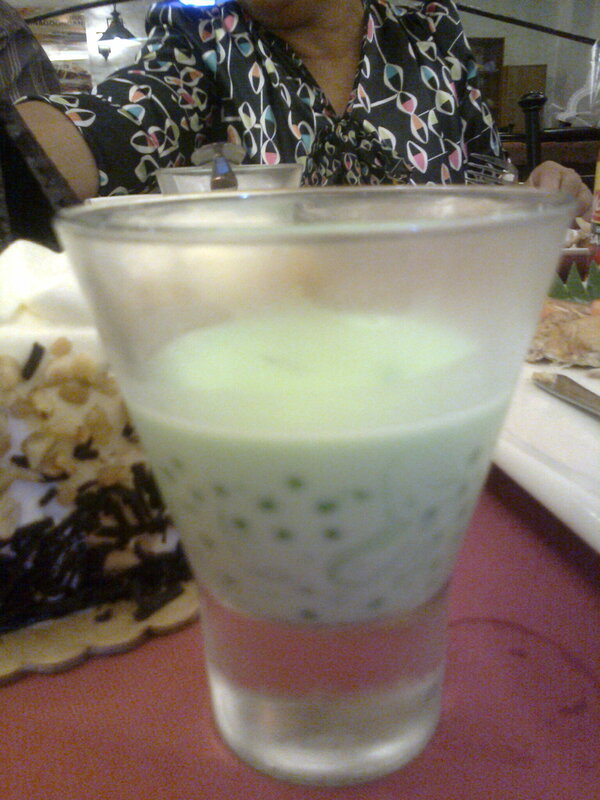 Burong kapampangan looks like porridge, mainly because this is fermented rice. The taste is sour-y with a hint of salt and sautéed garlic. When cooked, the buro smells heavenly but in its raw form, it smells like “hell” (pardon my language). At such a young age, my mom and dad has introduced this food to me and my siblings. I was 7 when I got the chance to eat buro. My dad actually tricked me to eating it. They did not tell me what it was. During lunch, my mom cooked fish and sinigang na isda and instead of using the usual fish sauce as condiment, they served this whitish, paste-like side dish. At first I thought it was “bagoong”, only it’s white. I watched my dad as he ate enthusiastically. He seemed to be enjoying it so I got curious and tried it too. It was so good! The sour-salty taste of buro excites the taste buds and makes you appreciate your ordinary fried fish and steamed vegetables. After that lunch, I established my love for buro. Since my dad loves this dish so much, my mom (who was Bikolana) mastered the preparation of buro. Surprisingly, each buro is unique. My mom’s buro is never the same as my grandmother’s. How do you make and cook buro? 1. Buy fresh fish (gurami, medium-sized) and/or small shrimp. Make sure all raw ingredients are fresh. 2. Set aside 4-5 cups of rice. 4. Mix rice and fish. Add salt, depending on your taste. 6. Once it’s ready, prepare garlic, onion, tomatoes and ginger to sauté. 7. Then pour in the mixture. 8. Allow the fish to cook. Make sure that the fishbones are soft enough. 9. Cooking time will take about 15-20 minutes. The preparation and cooking process seem easy. In reality, preparing the buro takes years and years of practice. And like all cooking, it is best done with a dash of love. My cousin and her boyfriend will tie the knot this Saturday and it is quite a privilege to be chosen as Maid of Honor. While it is an exciting day, one of the common fears is how to fit in your gown come the event. They got my measurements last July and added half-inch allowances. Come November, I was called back for final fitting. Guess what? The dress fit exactly. It looked perfect but the designer asked me to maintain my current size until the wedding day. I just smiled thinking it’s going to be easy. First problem was I couldn’t quit drinking Starbucks’ Espresso and Frappes. Aside from being a coffee-lover, I am also collecting stickers for my planner. Second, December is a time of get-togethers and reunions. I’ve been meeting up with friends and officemates over dinner. Sometimes, I just eat salads during our meal. 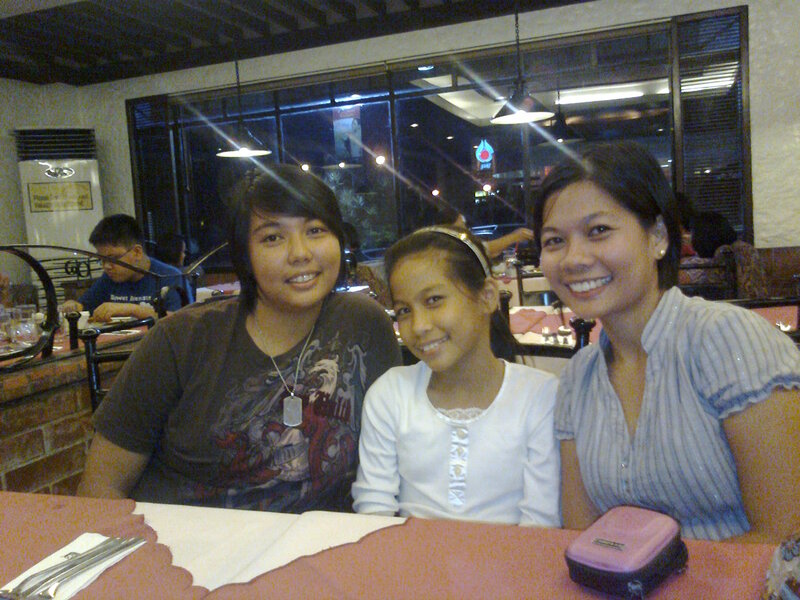 I enjoyed Pizza Hut’s Waldorf and Sicilian Salad and Cyma’s Tonnos Salad. With just two days before the wedding, I am down with my last resort to ensure that I fit in my dress: crash diet. For two days, I am planning to just eat fresh fruits and juices. Definitely no rice and meat. But I just cannot live without coffee. Sorry. To top this crash diet, I’m filling myself with alkaline water. I know it is not a really good idea, this crash diet but what can I do now? I’m hunger… a common expression among my college friends every time we feel very hungry. 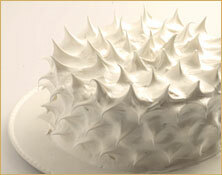 Today, it does not help that I am thinking of Chocolate Kiss and their delectable food and pastries. Just two weeks ago, I got the chance to visit this quaint little shop. The original café is located at the 2nd floor of Bahay ng Alumni, inside UP Diliman Campus. To date, there are two other branches. One is located at the ground floor of Bahay ng Alumni while the other one is along Roces Avenue, Quezon City. Back to the food. My favorite staples at Kiss are Carbonara Supreme, Puttanesca, Devil’s Food Cake, Date Walnut Cake and bars and their homemade iced tea. Yum! Yum! 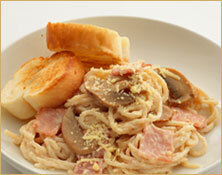 The carbonara is so creamy with lots of bacon! And so affordable too. Their version of puttanesca is just mouth-watering with lots of olives and fresh tomatoes. No matter how filling the pasta is, there is always room for the cakes. After all, these sinful pastries are their signature products. So I cannot allow myself to leave the premises without trying either Devil’s Food Cake or Date Walnut. For this particular trip, Ate Joey and I both had Date Walnut Cake. Yum! Yum! Yum! Yum! The cake is moist and it gives you a feeling that each bite will melt in your mouth. 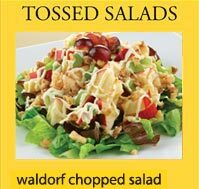 But the chopped dates and walnuts add texture, gives a twist. I just love it! Every Chocolate Kiss experience is memorable. When will be my next visit? carbonara supreme, creamy sauce lots of bacon!